Ornate Gothic Silver Cross : LOVE2HAVE in the UK! 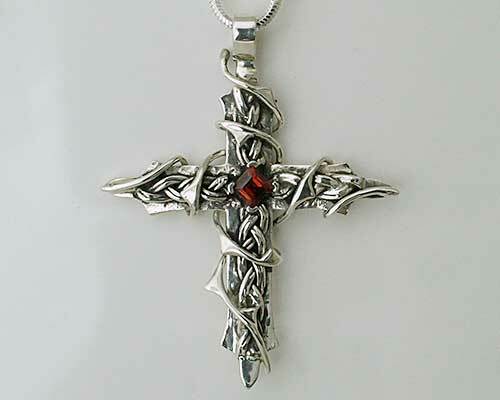 An ornate solid sterling silver Gothic cross that comprises of meticulously wrapped shaped silver wires. 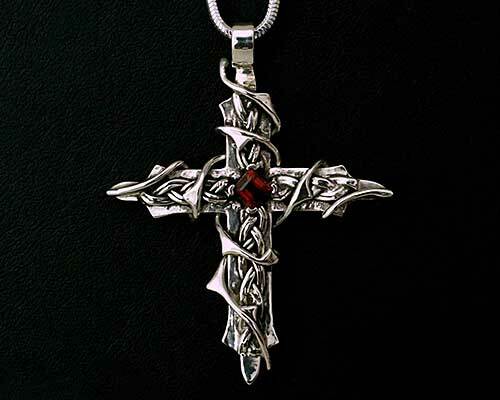 The cross features intricate detailing in the form of vines and thorns intricately worked by hand giving it an overall look of real three-dimensional quality. We would say that the design comes inspired by the natural world and has a delicate balance of both Celtic and Gothic design. The attention to detail is not only conveyed by the vines and thorns but also in the shape of the cross too, with the ends slightly tapered outwards. At the centrepiece sits a 4mm deep red garnet and the designer has made available other stones also, so please do contact us for further information. We like the size of this piece, being approximately 50mm high by 40mm wide. It comes threaded securely onto a thick 18-inch silver snake chain.